The India Mela will take place at Meriken Park over three days on October 6, 7 and 8. Growing in scale and popularity every year, India Mela celebrates Indian culture and has something for everyone to enjoy from traditional to Bollywood style dancing, a fashion show, Yoga and a bazaar with all kinds of authentic Indian cuisine on sale. 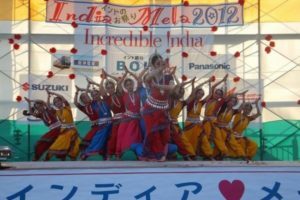 India Mela takes place in Meriken Park every year in the port of Kobe, one of the first ports in Japan to welcome foreigners into Japan over 150 years ago. To this day, Kobe remains one of Japan’s most international cities with many ex-pats calling the city home.